Is This The New Miami Dolphins Logo? Now that the Dolphins are officially out of the playoff hunt we can start looking forward to the future. After we beat the Pats next week and before the draft one big item needs to be talked about… the new logo. Mike Dee promised to make an announcement on the new logo soon and I know the Dolphins nation is very worried. There has been so much speculation and concern, but let’s talk about what we know for sure. The new logo would be a mix of modern and retro. He implied that navy would still be an accent color. He showed the logo to Dan Marino, Bob Griese and Nat Moore and they all loved it. Recently I was presented with some new information about the logo. If I hadn’t been in the exact place and time this would have never come together. The first bit of information is that a Dolphins fan and friend of mine has been showing off this logo that he swore was a sketch of a design for what would become the Dolphins helmet. I didn’t put too much stock in it because it didn’t look anything like any logo I had seen and the Dolphin looked a bit too much like a whale. Fast forward to last Sunday and I was talking to a friend who happens to work with Nike and was bragging about how they had seen the new uniforms and logo. I don’t want to say too much but their job requires seeing new uniforms well in advance of most people. They of course have to sign a non-disclosure agreement and couldn’t tell me anything except that they didn’t love the logo because the Dolphin looked too much like a whale. That seemed like too much of a coincidence and my friend who had showed me the logo happened to be standing right there. He showed my Nike source the photo on his phone and they flipped out. “How did you get that? !” the source asked. Evidently the logo he has had this whole time is “very very close” to the new logo. Today I saw my friend again and asked to see the logo again. I took a photo of his phone with my phone and although it’s a terrible picture I am VERY confident that this is a rough draft of the logo. If you look carefully the fins are navy and there are sort of navy accents on the Dolphin. This is a sketch but like I said, I am 95% sure the Dolphins new logo is going to look a lot like the photo above. Other bits of information I got from my source is that the Dolphins will not have an orange jersey next year and that the Vikings new uniforms are retro and “awesome”. The source seemed to like our uniforms more than the logo and hinted that they were retro, but wouldn’t say much more than that. Now as a very loyal Dolphins fan I was conflicted about leaking what I believe to be the new logo, but I don’t think any news source would take my friend of a friend story seriously and I don’t think many people will pick up on this. 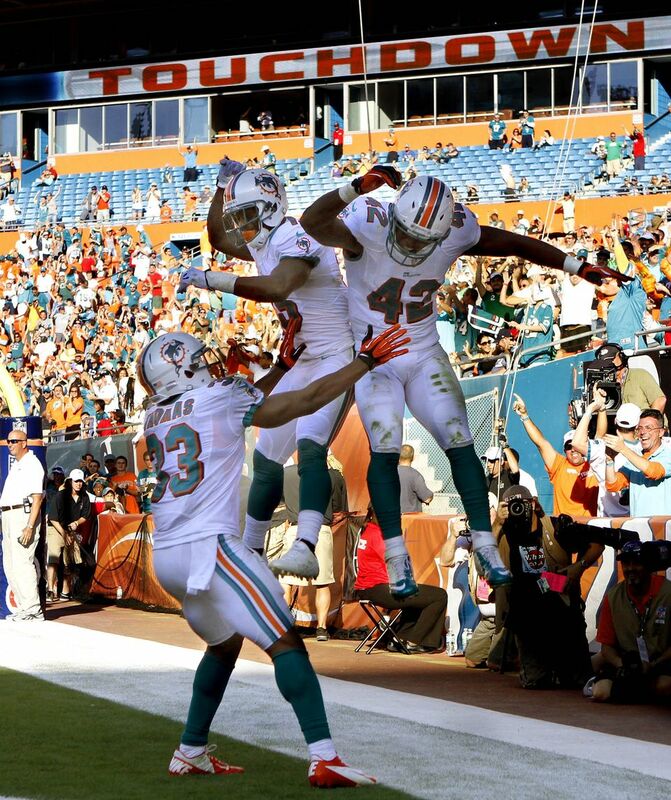 But when the logo comes out I can point to this and say that DolfansNYC broke the logo first! Then again there is a small chance I am totally wrong too. So I guess we will just have to wait and see. Lastly, I don’t hate the logo. I am a big fan of the stupid helmet on the Dolphin so I will miss that, and yeah it looks a lot like a whale, but it could be a lot worse. I am still pretty excited to see the new uniforms that my source seemed to think would be revealed at the NFL Draft. Ross had to put his stamp on this team and I don’t hate the logo and I am sure five years down the road no matter what the logo looks like we will still all love it. 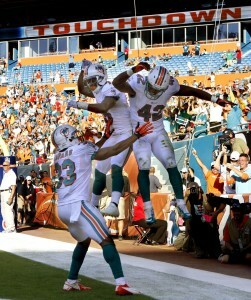 Go Dolphins! I shall not be at another regular season game at Third and Long as I am flying home to London for the holidays. So barring a Christmas miracle of a Miami post season chances are I won’t get to catch up with many of you until the draft. So here’s to hoping. The list of of injuries keep mounting, maybe we have been luckier than other teams for most of the season but this feel like a really bad time to start getting them.Since the Dolphins beat the Jags last week I have seen a number of articles and posts relating to the fact that the Dolphins are still alive in the playoff race here. Still alive yes, but with a very weak pulse and on life support, about ready to flat line as early as this Sunday. Week 15 produced the perfect scenario to keep us in it, all the teams that we needed to lose did just that and we won. Thing is when the playoff spot that you can theoretically get hangs in the balance of so many external factors, although it is an exciting prospect I grant you, the only thing the Dolphins can do is continue to win and let the chips fall where they will. Because without victories against the Bills this Sunday and the patriots the following Sunday it really doesn’t matter what else happens. Ryan Tannehill needs to focus on one game at a time. He has been performing well as of late, at least to the extent where he is no making any rash decisions and turning the ball over. But is lack of TD’s seriously is concerning to me, its not really being discussed because for the most part the seasons expectations have been exceeded and he has looked decent. But in this category he is infinitely behind on all his fellow rookies, and we cannot put this purely down to the fact that he doesn’t have that elite receiver because Hartline and Bess have both been fantastic and there has been a supporting cast that can make it work. Weeden has 14 with the Browns, who the hell is he throwing the ball to? Russell Wilson has 21 in Seattle. To some extent its been the play calling. The reality is though that if the team ever wants to be competitive in a post season then we need to score more points. All the teams that will be playing in January will have QB’s who can produce in the red zone. Chad Henne started the season riding the pine for his new club, theÂ Jacksonville Jaguars. 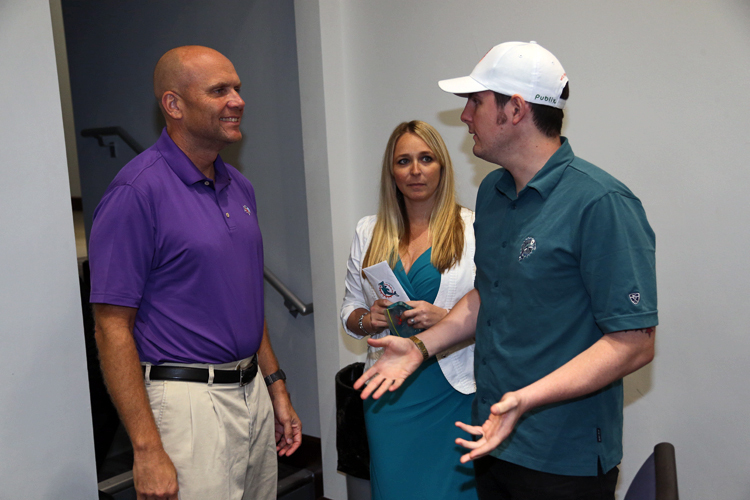 Following a season-ending injury to second year bust Blaine Gabbert, Henne has already gotten his second chance at a starting job in the NFL. Thus far, he has done a very good job of ensuring that he keeps it. In less than half the amount of games as Tannehill, Henne has managed to match our rookie QB’s 8 TD passes. He returns this Sunday for the first time to square off against his old club, a place that probably does not hold too many happy memories for him, just much disappointment for promise unfulfilled. But at this point of the season, this is one of the more intriguing aspects of this game, as it holds no playoff implications. In some forums, I see that people are still calculating all the things that would need to happen to get to the postseason, but the reality is that we are done; Tannehill acknowledged as much this week. When all the things that need to happen for the postseason are mostly out of your control, it does little good to speculate on it. When Michelle and I started DolfansNYC we knew there wereÂ opportunitiesÂ to make money doing it, but both of us felt the exact same way. We didn’t want to bring money into the equation because we are doing this for the love of the Miami Dolphins. We never even really had a conversation about it but we knew we would donate all of the money we made to charity. Since 2009 we have been making yearly donations to both The Miami Dolphins Foundation and a local charity the I Will Foundation. The last two years we have also made donations to Ride DCC, the Dolphins Cycling Challenge. It’s been great to be able to give back, but this year has been really special. Aside from the three charities I mentioned we also made a small donation to a breast cancer foundation and did a big online fundraiser for Hurricane Sandy relief. 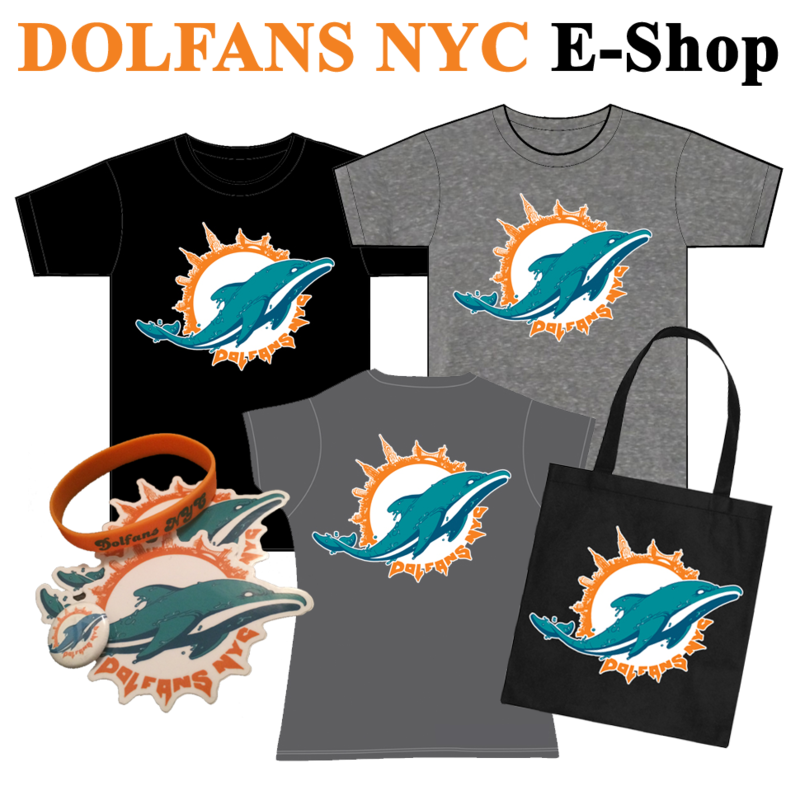 Hurricane Sandy hit DolfansNYC hard and we wanted to do something to help out. Originally we were raising money for the Red Cross but after I took a trip out to the Rockaways, Roxbury and Breezy Point we decided to donate the money instead to Habitat For Humanity. Almost everyone we talked to said they were doing the most good in the area. We are also going take another $500 and donate it to a yet to be named Rockaways specific charity in honor of one of our mostÂ committedÂ DolfansNYC members Bryan who had thousands of dollars of damage done to his place including losing 90% of his DolphinsÂ memorabilia. On top of all that money raised we also raised enough to buy a new order of DolfansNYC shirts, pay for some food/supplies for our JetsÂ tailgateÂ and pay for some other random club costs. It was a great year despite the Dolphins play on theÂ fieldÂ and we hope this is a new standard that we can reach every year. Thanks so much everyone! Go Dolphins! Ps. If you donated do the online Sandy Fundraiser I am going to be sending your prizes out soon. You should have them by Christmas! The Miami Dolphins are about due a victory of the Patriots – in the last 4 meetings between the two teams, the Patriots are 4-0. This simply will not do. They are travelling to our turf; and if what I am hearing around the interwebs is true, then home field advantage is unlikely to be in effect, as it seems that they will have just as many of their supporters present, if not more. One report I read suggested that the Dolphins’ offense have been practicing with loud crowd noise blaring away this week in preparation for just that scenario. It’s embarrassing but it seems that that’s just the way it is. The Brady-lead Patriots are just as good as they have ever been with the sixth round pick out of Michigan at the helm. Since taking over the mantle, Brady has made New England a perennial playoff team and a force within the AFC and the AFC East. 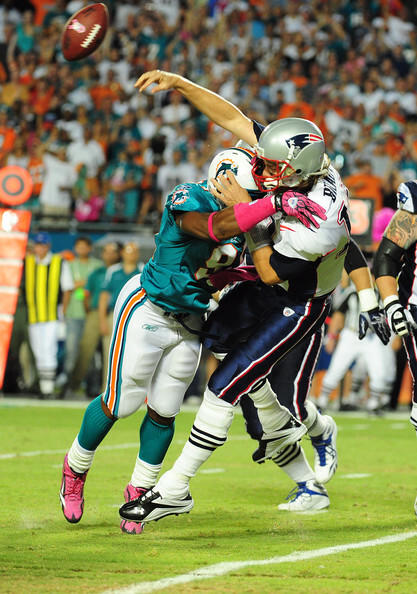 He is to Patriots football what Marino was to Dolphins football. They will sure miss him when he is gone. Look, this isn’t me just paying lip service to the guy – the fact of the matter is that the Patriots’ success hinges on Brady. The facts are that this Sunday we face a team that is 1st in scoring, 1st in offensive yards and 4th in passing yards, on the shoulders of the QB. Brady is putting together another MVP-calibre season having thrown just the 3 interceptions and currently holding a QB rating of 105.2. They are good, but Brady is the cog in the machine that keeps this team ticking over so nicely, disrupt his game and the whole thing kinda doesn’t work so well. Yeah, the running game currently ranks 6th in the league, but make no mistake, many of those are Brady’s yards as as well, he just now has a running back who can make the most of a great passing game.